and help others get ahead. He didn't claim special privileges. Whoever wants to be great must become a servant. Whoever wants to be first among you must be your slave. in exchange for many who are held hostage. Last night in Bible study, we studied and discussed the topic of being a servant. We talked about how Christ had all power and was deity and equal with God, yet he laid all that aside and acted as a servant to all. He did not demand recognition for his kindness, he did not act prideful about all the giving things He did for others. He put others before Himself. And in His Word, He challenges us to do the same thing. 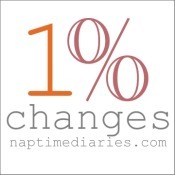 My 1% Change for this week is to work on having more of a servant attitude in my marriage. I'm going to try to ditch the attitude I can sometimes get when I decide that I've done enough and it's someone else's (that would be Dave's) turn. I'm going to try to stop being so "me" focused and start being more "him" focused. And when I do perform acts of servanthood, I'm going to try to stop expecting recognition, expecting something in return. Because it's not about recognition and building my "I did good" list. It's about following in Christ's footsteps, freely giving more than is expected, because He told me to and because that's how we become truly great in His eyes. He set the example, and I am to follow. If anyone would like to come along beside me for this challenge this week, please do share. I would love to have some accountability. Is there any area of your life that could use a bit more of a servant attitude?